I have some black Chloe scalloped flats that I bought last season and am loving right now. They are amazing and they were expensive. Thought it might be helpful to do a round up of the most stylish and affordable flats for fall. Nothing like a good stylish comfortable flat for running around town to get things done. And this year has so many amazing, different styles. Gone are the days of just your average ballerina flats. Here are 17 of the best affordable flats for fall and winter 2018/2019. Most on the list are under $100! Summertime means outdoor dinners out on my patio! I recently decided last minute (per usual) to cook Sunday night dinner for my family making my famous summer grilled chicken with a lime cilantro garlic marinade. I invited two people and then naturally that number grew to five after giving everyone a heads up only three hours beforehand. As it goes… I didn’t have a lot of time to prepare, but my first step was to set up a simple summer table! I couldn’t wait to put my new AERIN Ardsley collection (by Aerin Lauder) from Williams Sonoma to use. Decisions, decisions! As you know, we have been hard at work on the COCOCOZY Design House. Today, it’s all about two main exterior hardscape surfaces — the front walkway and back balcony. Curb appeal is everything when designing a house… especially one that is going on sale! Sometimes a book is judged by its cover. Lucky for me, the facade of this house is already so amazing — my main goal is not to mess it up! The Cement Tile Shop has come on as a partner to help me in that effort. The photo (above) is what I’m using as my main inspiration for this part of the project. Now, before I go any further, I just want to note that this house is a work in progress. Please read using your imagination for what the space will look like. And don’t worry, I will show you all the final result as soon as I can! Time for some kitchen planning! The cabinets have been ordered, appliances have been selected, and now I am thinking about counters. I am super duper lucky to have another wonderful company on board to provide product for the COCOCOZY Design House. Caesarstone has generously agreed to supply all of the countertop material for the kitchen and the baths. I had Caesarstone counters in my first house — you all may remember that tiny little cottage in the Hollywood Hills. Now for my first COCOCOZY Design House, I went to Caesarstone as my first choice for counters! Taking a quick break from the COCOCOZY Design House craziness for a Laurel Canyon home tour! I lived just east of Laurel Canyon for such a long time, so this one hits home for me. I love the rustic nature of living in the hills above Los Angeles. One of my favorite things is finding a really refined spaced in the midst of the windy roads. This grand 1925 Mediterranean-style mansion belonging to interior designer Brigette Romanek and her husband Mark is quite fantastic. It is a 2800-square-metre untraditional family home (previously owned by legendary music producer Rick Rubin) that has true California refinement and obvious musical history. Let’s take a peek (below)! Introducing The COCOCOZY Design House! If you’ve been following me on Instagram, you already know that I’ve started my first big COCOCOZY design house project! And now that I’ve got my footing, I want to bring you all along on the journey with me in hopes we can learn a thing or two together! Basically, I bought this house as an investment property a few months ago in an historic area here in Los Angeles called View Park. The Spanish Style home is 1860 square feet and was built in 1931. It sits on a large, magical lot surrounded by palm trees and birds of paradise. It was 3 bedrooms and 3 baths — but now we are morphing it into a 4 bedroom and 3.5 bath home! Trend Alert: The Macramé Movement Is Back! The macramé trend has found a second wind! The bohemian textile art form of knotting and hitching is best known for its popularity in the ‘60s and ‘70s — and now (thanks to Instagram and Pinterest, probably), it’s back and better than ever! From plant hangers, wall hangings, curtains, chairs, pillows… I’ve been seeing macramé more than ever! Check out some of my favorite room inspiration and shoppable items (below)! We’ve talked about dreamy freestanding tubs before, but now I want to chat about two-toned clawfoot tubs! I just bought a vintage clawfoot tub for my latest design project — and like most of my finds, it’s in great shape but needs just a bit of refurbishing. Full disclosure, I never in my life thought I would want a clawfoot tub… it seemed a little too quaint for me. Never say never, I guess, because now I’m obsessed with the idea of having a two-toned clawfoot bathtub — black and white in particular. Below I’ve rounded up some of my favorite photos of the trend for inspiration! Spring days call for Spring Gray! 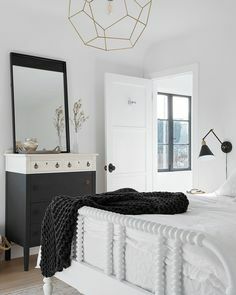 I keep spotting rooms, architecture, and home accessories with gray accents — and I just love how the typically-drab color is being used to make other colors (including white!) pop. Incorporating gray can keep your space sleek, neutral, and of course, oh-so cozy! See some of my favorite spaces for inspiration (below)! Time for a little spring organizing! As a fan of cozy spaces, I’m often searching for ways to find extra room for storage in every area of the house. What I’m finding is that it’s possible to find homes for all your unsightly belongings with furniture or bins that you’ll want to show off. My first tip would be to get rid of anything you do not need or use regularly. There is no reason to hang on to anything that isn’t adding value to your life. Haven’t worn that sweater in a year? Two years?? Donate it. Once you’ve narrowed it down and are only looking to store what you absolutely need, find chic ways to incorporate it into your decor! Take a look (and shop!) some of my favorite finds for easy home storage that are pleasing to the eye (below)!